The majority of Inuit people (73%) live in the Inuit Nunangat (Inuit homeland). This is made up of Nunavut, Nunavik (Northern Quebec), Nunatsiavut (Labrador), and Inuvialuit (Northwest Territories).1 It is reported that 39% of Inuit people in Inuit Nunangat live in crowded homes2, 33% of the homes are in need of major repair, and 33% are in core housing need.3 Inuit people are 10 times more likely to live in crowded homes and 5 times more likely to live in homes in need of major repair than non-Indigenous people. 1Statistics Canada. (2011). Aboriginal peoples in Canada: First Nations people, Métis and Inuit. Ottawa, ON: Statistics Canada, Catalogue no. 99-011-X2011001. 3Canada Mortgage and Housing Corporation. [CMHC]. (2015). 2011 Census/National Household Survey Housing conditions series: Issue 5- Inuit Households in Canada. 4Knotsch, C., & Kinnon, D. (2011). If not now … when? 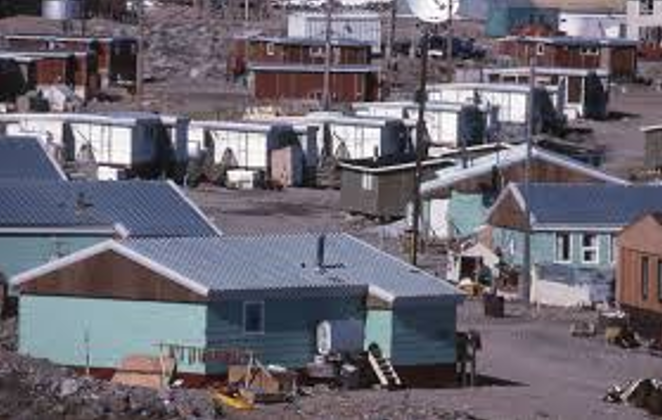 Addressing the ongoing Inuit housing crisis in Canada. Ottawa, ON: National Aboriginal Health Organization. 5Public Health Agency of Canada [PHAC]. (2014). Tuberculosis prevention and control in Canada: A federal framework for action. 6Kovesi, T. (2012).Respiratory disease in Canadian First Nations and Inuit children. Paediatrics & Child Health, 17(7):376-380. 7National Collaborating Centre for Aboriginal Health (2016). The 2009 H1N1 influenza pandemic among First Nations, Inuit and Métis peoples in Canada: Epidemiolog y and gaps in knowledge. Prince George, BC: National Collaborating Centre for Aboriginal Health.